I'm sure it is my enthusiasm for children's lit westerns like, Maude March and Deadwood Jones that first alerted me to this upcoming movie, or maybe it is the fact that our entwood now extends to the continent of Oz. In any even, this trailer for Australia caught my eye. 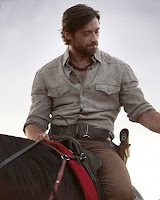 Or maybe it was Hugh Jackman with scruffy beard on horseback that um... well... anyway. I have apparently been under a rock and not heard anything about this movie. Not you've made me think, are there any children's books with Aboriginal peopel as characters? I need to go back and check out the Australian summer blast tour from last year. 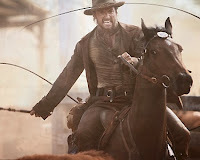 I'm not sure why, but Hugh Jackman--like Viggo Mortensen--actually looks even BETTER with a scruffy beard on horseback...sigh. Have you read Follow the Rabbit-Proof Fence by Doris Pilkington/Nugi Garimara? It's not exactly YA but it's the story of the author's grandmother, who escaped a government institution for aboriginal children. The writing isn't great, but the story is unbelievable. Oh thank you. Did they make a movie about that book? Going over to IMDB now.